It's been one week since I got back from vacation and apparently I just couldn't keep myself away from the beach. On Sunday morning, Zev and I woke up at 5:00 AM and drove down to our favorite place in South Carolina. We had planned to head down Saturday and sleep in our car, but it didn't end up happening (saving it for next time!). 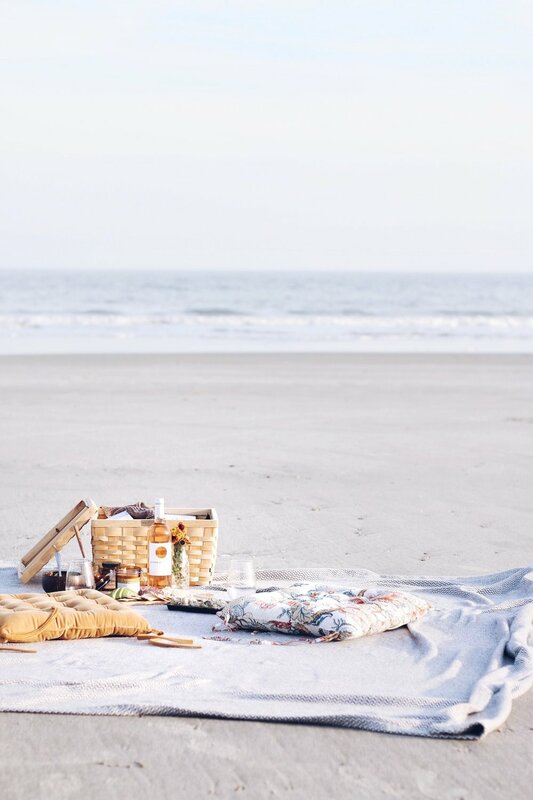 I had already planned to make a picnic for us, but when we decided to drive to the beach I got even more excited. I've recently been obsessed with outdoor setups - brunches, bridal showers, birthdays, etc. 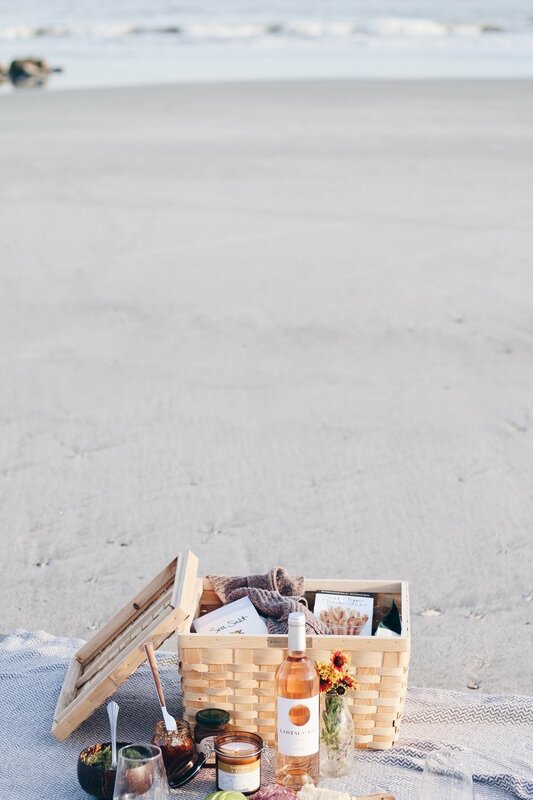 The idea to create a "pinter-esque" picnic got all my creative blogger-juices flowing. A relative of mine just sent me a package from Stonewall Kitchen for Christmas, which conveniently had this cute little picnic basket in it (along with a delicious assortment of spreads, jellies, and salsas - which we devoured). I brought avocados to make guac, various chip-y items, and we stopped at the wonderful Bert's Market in Folly Beach for cheese, salami, apple, and sushi! Yes I brought a bottle of wine, and yes we brought an obvious collection of glass to the beach. But that's besides the point. 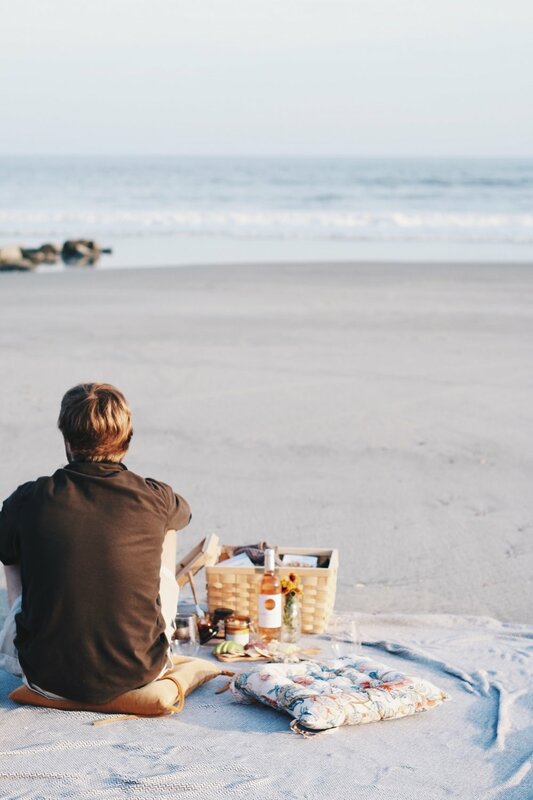 A night spent with your best friends or significant other, sipping on rose, and watching the sun sink into the ocean is definitely bucket-list-worthy. This idea can easily be adjusted to different settings - on top of a mountain after a hike, at the park, or in your backyard! Getting creative with date ideas (even with friends) is so important. Life can get so hectic, but can also easily feel mundane. It's important to realize that not every moment is going to be perfect, but just making the effort and enjoying something new is enough to decrease stress levels or let someone know that you love them.